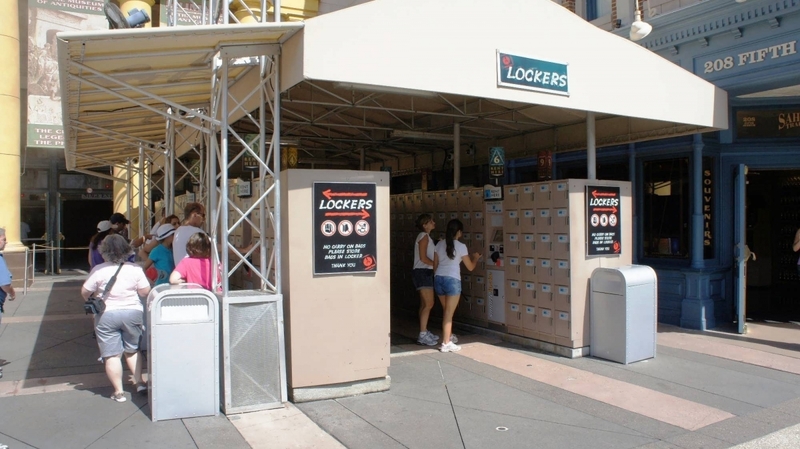 Lockers, as simple as they may be, will play a pivotal role in a successful visit to Universal Studios Florida, Islands of Adventure, and Volcano Bay. 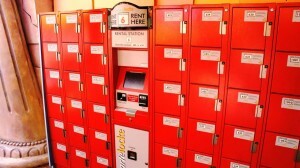 Whether you are interested in renting a locker for the day – so you do not have to carry all of your belongings at once – or whether you need the ride lockers to stow loose articles, it is to your advantage to know how the system works. This page presents all the information you need so you can make the best plan for your family. 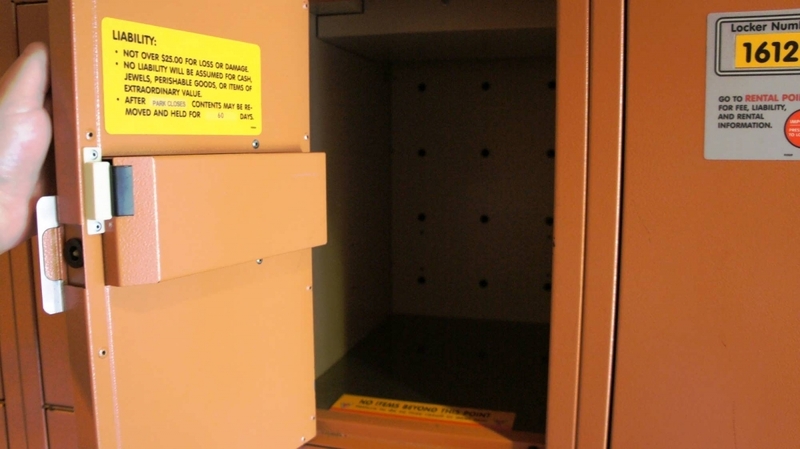 Want to skip all the basic instructions and read our insider tips for locker use? We have many listed at the bottom of this page. 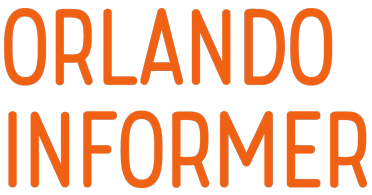 Want to know exactly what Universal allows you to bring into the parks? Their policy is listed at the very bottom of this page. 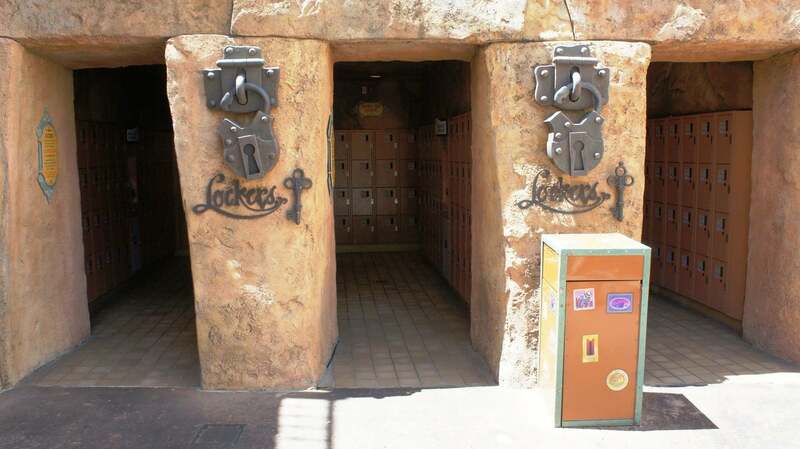 Now is a good time to open our map of Universal’s lockers (this will open in a new window). IMPORTANT: be sure to switch the map to Satellite View for ease of use! 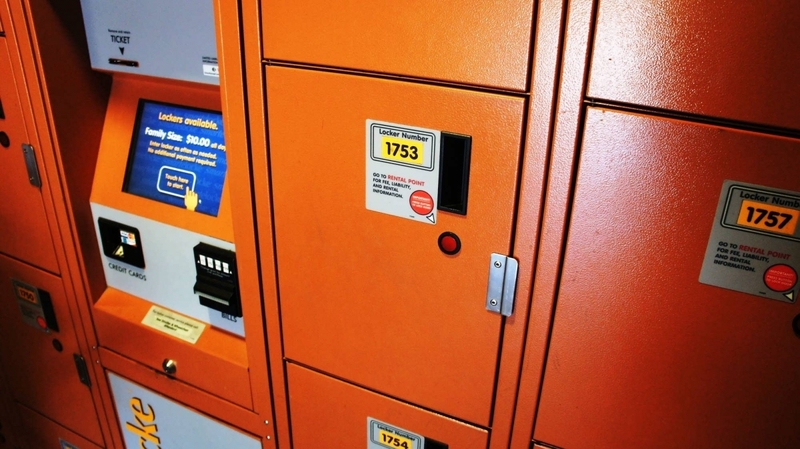 There are two different sets of lockers at Universal: lockers that charge a flat daily rate, which are located at the front of each theme park and scattered all throughout Volcano Bay, and lockers that may or may not require a payment attached to certain rides. 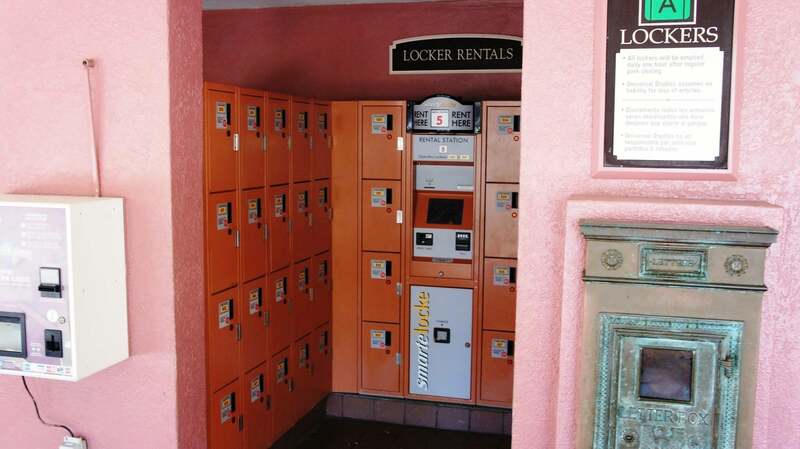 Since you will encounter the daily rental lockers first as you approach the parks, let’s start our discussion here. 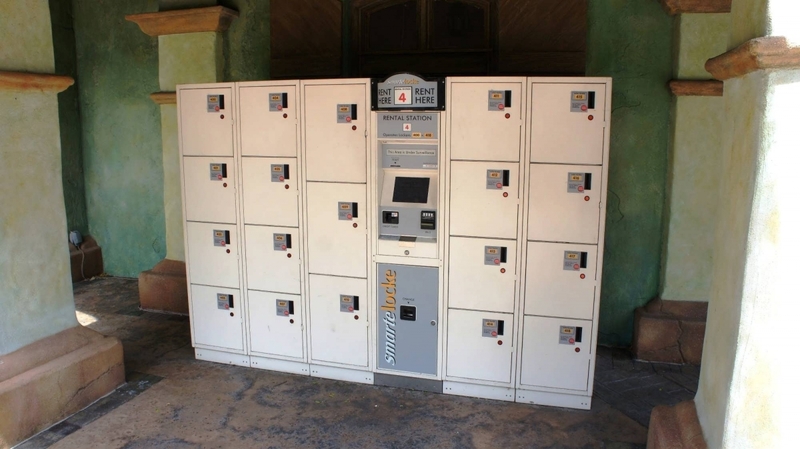 At the front of each of Universal’s three parks, outside of their turnstiles, there are lockers that can be rented for the entire day. (Note that the two theme parks also contain further sets of lockers inside the turnstiles, as well.) 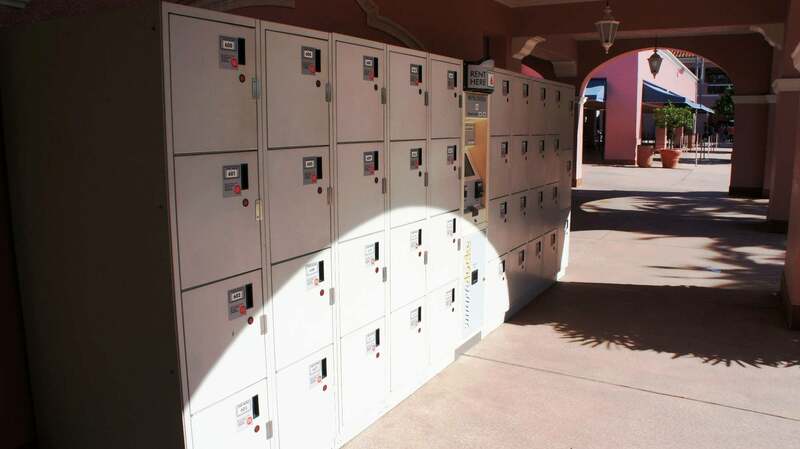 You pay a flat rate for these lockers, and you may open and close them as much as you want during your day at the parks. Note: the USF lockers outside of the turnstiles have been temporarily removed. 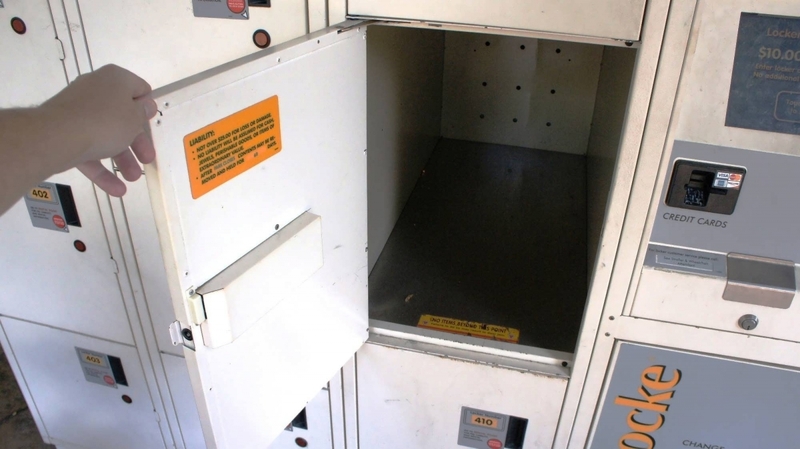 These lockers only come in one size – W 11″ H 16″ D 16″ – and they cost $8 for use throughout the day. There are two more photos in the gallery below. 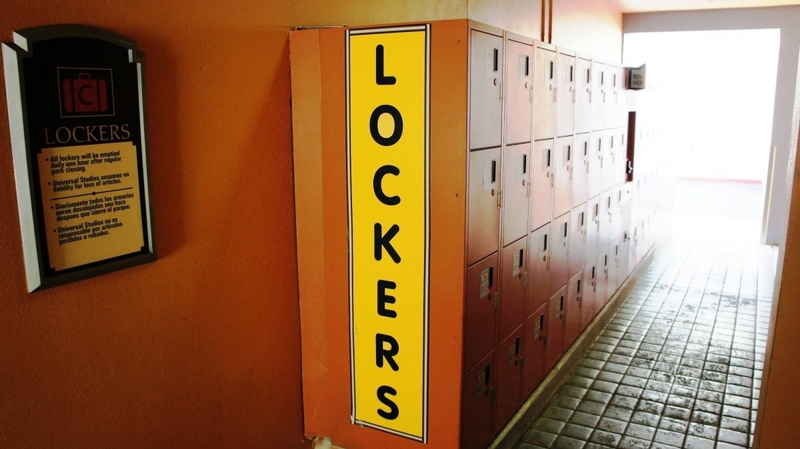 These lockers are also W 11″ H 16″ D 16″, and cost is $10 for the day. 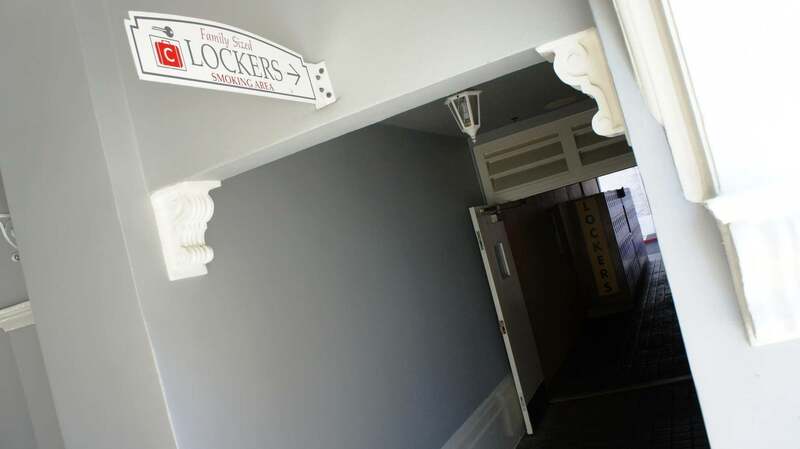 Down that hallway, you will find lockers that are slightly larger and slightly more expensive – W 14″ H 15″ D 23″ for $12 per day. There are two sizes available here for two prices – W 11″ H 15″ D 15″ for $8 and W 14″ H 15″ D 23″ for $10. Volcano Bay’s is the easiest yet: it has only one set of outside lockers, which is located on the right of the entrance, just before the large “Volcano Bay” water feature. 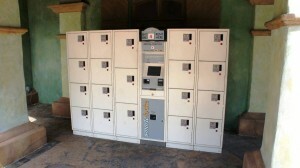 Unlike their theme-park counterparts, these lockers are all just one size but cost the same ($12). VB lockers – set 8. Outside the park, to the far right of the entrance. 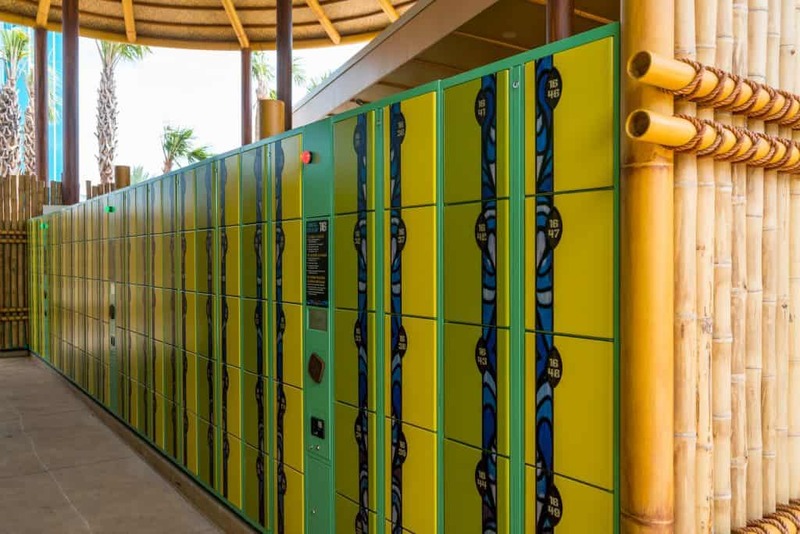 OI Tip: even if you’re tempted to use these lockers outside of Volcano Bay, we strongly recommend that you resist the urge and, instead, wait until you’re inside the water park before grabbing one – as we’ll see in a little bit, they’re much more convenient. 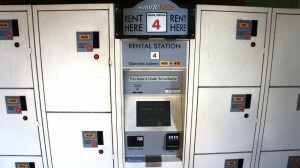 Paying for the daily rental lockers is very easy. They accept either cash or credit cards; you simply approach the main rental kiosk, choose your language, choose your locker size (if applicable), choose the level of your locker (you can decide between a locker near the ground or near the top), and process payment. You will also be asked to enter a six-digit code to use in the event that you forget your locker number. 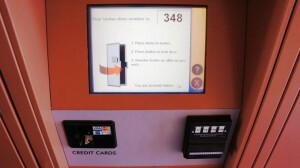 Once payment is processed, you will receive a receipt with your locker number, and your unit will unlock. After you are done placing your items in the locker, press the green button by the locker door, and it will lock. To retrieve your items, return to the same kiosk and input that you want to retrieve items. You will be asked if this is your final time grabbing your belongings. If you choose no, you will continue to have access to the locker; if you choose yes, you will no longer have access to the locker once you have opened and closed the door. The daily rental lockers at Universal Orlando are very straightforward, so there really are no “secrets” to using them. 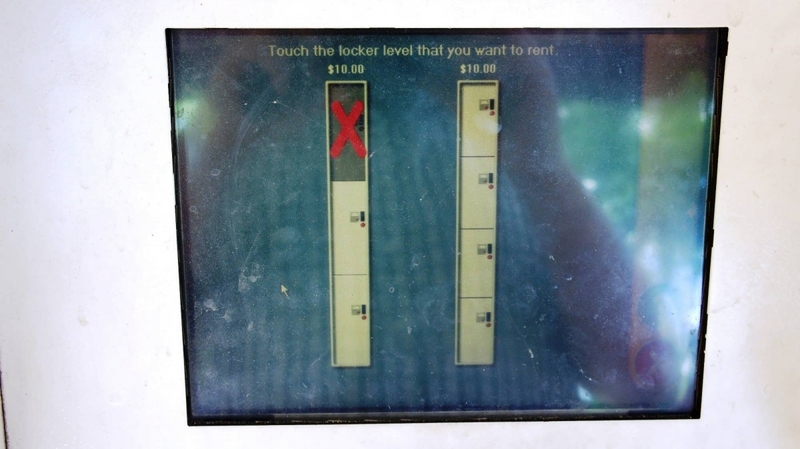 Just keep in mind that you can enter and re-enter your locker as many times as you would like throughout the day and you still pay the flat rate. Also, be sure to choose the position of your locker strategically. 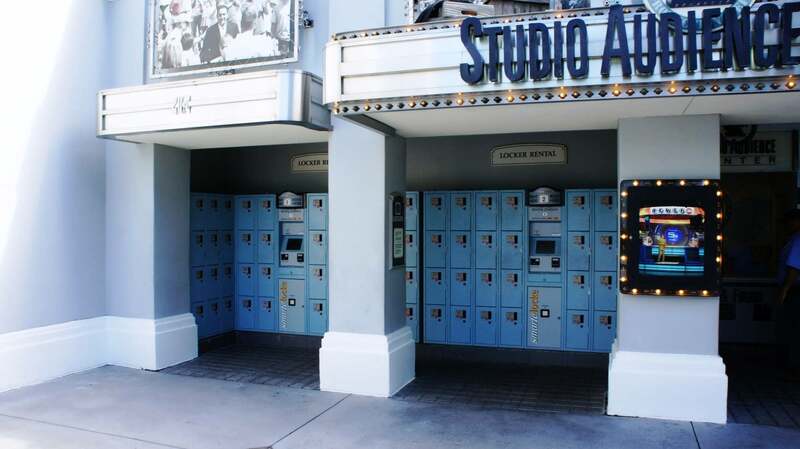 For example, if you are going to spend all day inside Universal Studios Florida, you will probably want a locker inside the park; this way, you do not have to exit the park to access your locker. On the other hand, if you plan on spending the morning at Universal Studios and the evening at Islands of Adventure, you may want to use a locker outside of Universal Studios, depending on when you plan on retrieving your belongings. Advanced technique: plan on spending the morning at one park and the evening at another? Consider visiting the evening park before you enter your morning park, then dropping off stuff in a locker outside of it, so it will be there at the evening park when you actually return later on. 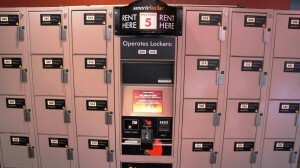 Lockers are provided at certain Universal Orlando attractions for your convenience. 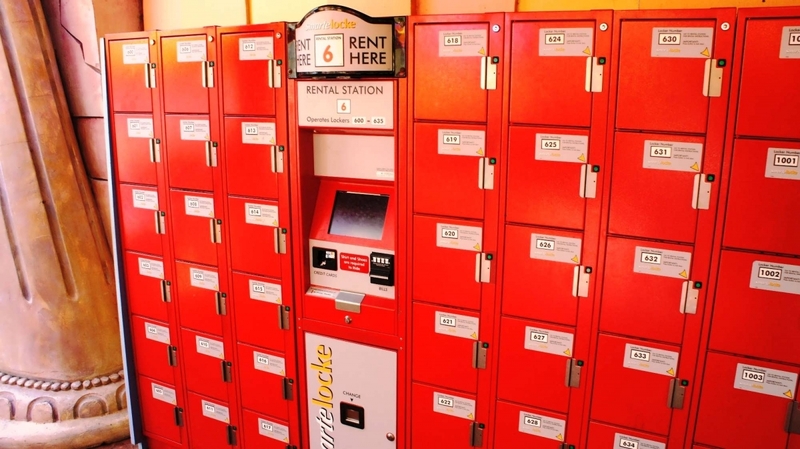 While the ride locker system can be a bit frustrating to get the hang of, once you have used them a few times, you should be able to move in and out like an expert. 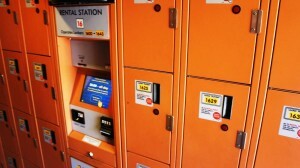 The ride lockers break down into two categories: those which are (largely) complimentary for the duration of your ride and those which you have to pay upfront to use. It’s important to note here that there are two different sizes at play: a standard (11.5″ wide x 5.5″ tall x 16.5″ deep), which is good for holding smaller items like purses and phones, and a large, which can essentially store everything else. Remember how we said these lockers are complementary? Well, they mostly are, but there is still an exception to this rule: the smaller size is free, but the larger ones cost $2. Keep this in mind because, if you have bigger items with you that you’ll need to stow away, you won’t have any choice but to cough up the dough. 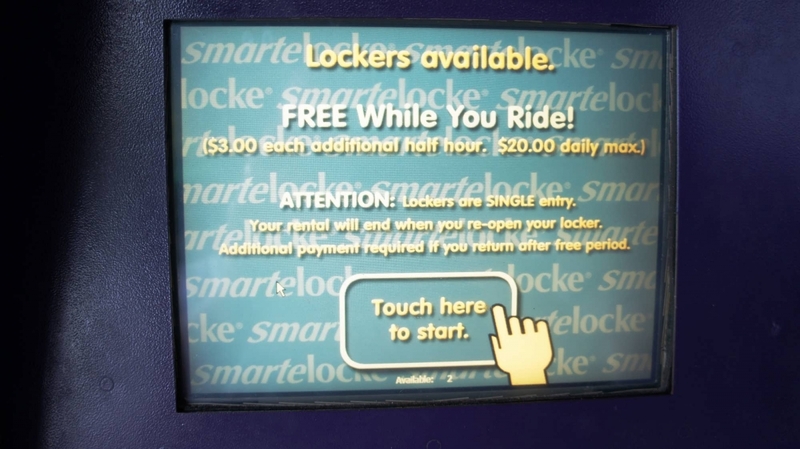 Also, now is probably a good time to explain what, exactly, “free while you ride” means – the locker system takes into account how long the ride wait is and the ride itself, and gives you that time plus a little cushion room without charging a fee. As long as you retrieve your items within that time, there is no charge – although, if you do go over that window, it will cost you $3 for each additional half hour (up to a $20 daily maximum). 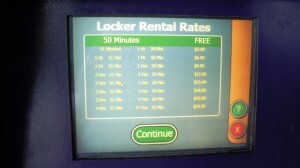 This overage fee is true for both locker sizes. 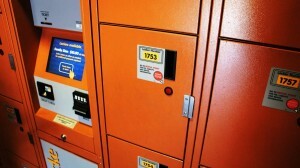 Finally, since no deposit is required, you don’t have to put any money in or scan a credit card before using these (smaller) lockers. Then you are asked to place your finger on a scanner similar to the ones at the park turnstiles. 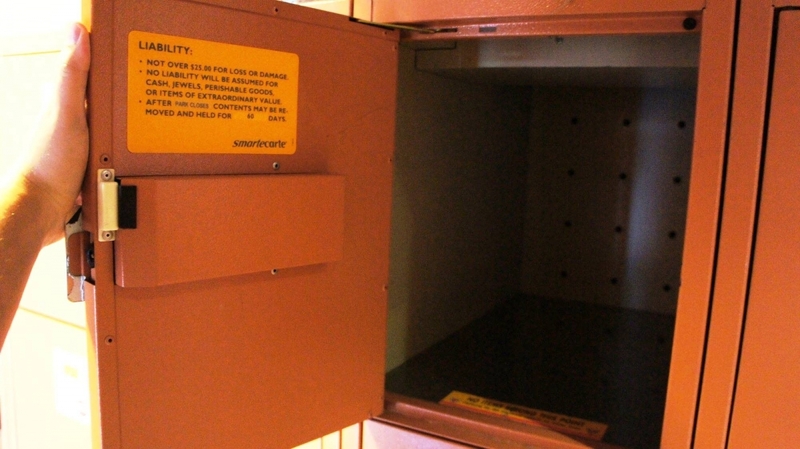 Your finger is scanned and you are assigned a locker. 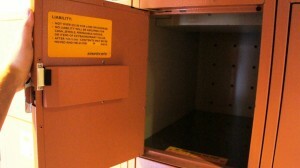 Find your locker, place your belongings in them, close the door, and press the green button to lock the locker. Now it is time to run off and enjoy the ride! 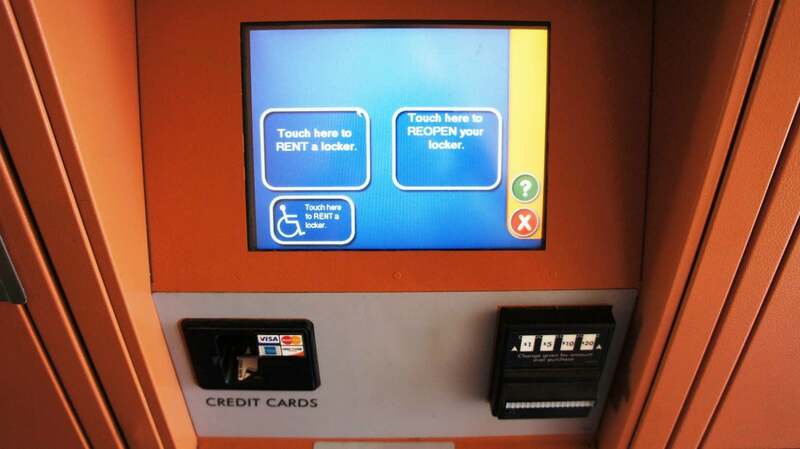 To retrieve your belongings, return to the same kiosk you used to rent the locker and input that you are picking up your items. You will be asked for your locker number, and a scan of your finger will be taken. 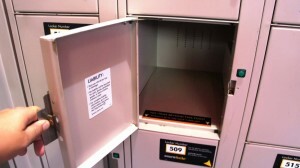 Then you will be warned that this is the final time the locker will open. What happens if I go over my time? There are three rides that do not require you to stow your loose belongings but that provide lockers just in case you want to. Can you guess which rides these might be? We’ll give you a clue: you and your possessions might get soaked! Because it is not mandatory to stow your loose articles when going on these rides, use of the lockers is not complimentary, with the price again depending upon the size: $4 for the smaller ones and $5 for large. These rates will get you about an hour-and-a-half of usage time, and if you go over the limit, there’s that additional charge again of $3 per each additional half hour (up to a $20 daily maximum). 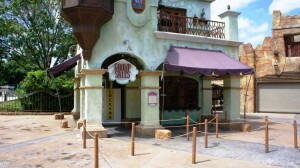 The three water rides do have places to stow your belongings on the ride itself, should you wish not to spend money on lockers. However, if you are carrying unprotected or sensitive items, like an expensive camera, you should opt to use the lockers. – First and foremost, be aware of the rides that require you to stow your belongings. 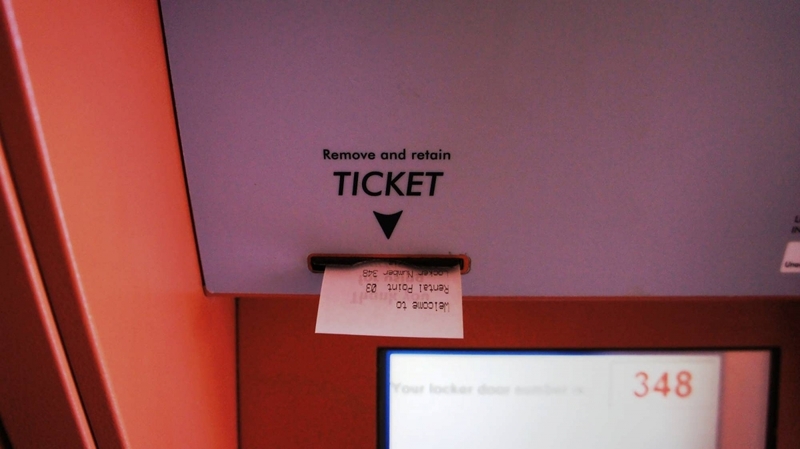 Should you happen to slip past the first ride attendant with your bag, only to find out halfway through the queue that you have to return to the lockers and stow it, you will be very frustrated – and you will lose your spot. 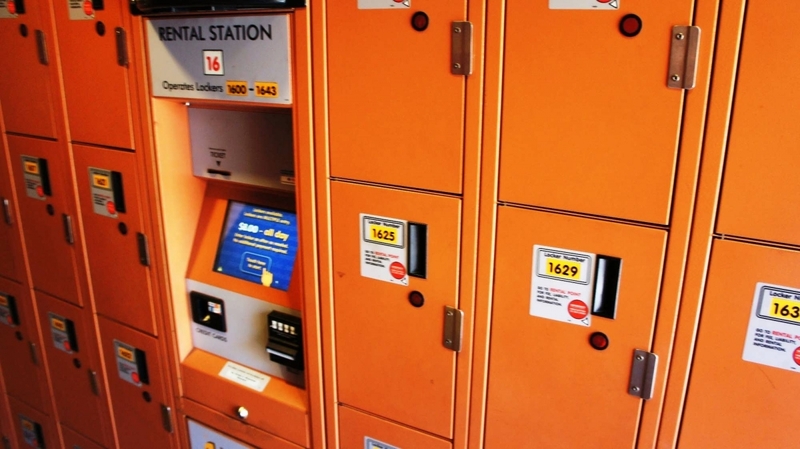 – You can use as many of the “complimentary for the duration of your ride” lockers as you would like, so don’t feel like you have to really cram your stuff in those small lockers. 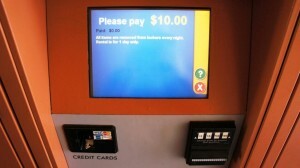 On the other hand, you do have to pay for each prepay locker you want to use. – Some queues sell refreshments during busier times, most notably Harry Potter and the Forbidden Journey, and these temporary refreshment kiosks are usually cash only. So it may be a good idea to keep a $20 in your pocket. – If you are using Child Swap on any ride (meaning that at least one adult is staying behind with a child while everyone else rides), you do not have to use the lockers. You will need to inform the ride attendant of this; otherwise, you will be told to stow your belongings as you enter the queue. Keep in mind, depending on how many bags you have, you may still opt to use the lockers, so you’re not overburdening the non-riding adult with several bags and a disgruntled child! 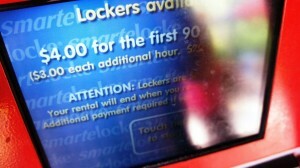 – When making selections on the touchscreen at the locker kiosks, try using your fingernail. 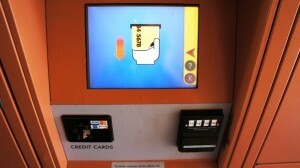 The screens seem to detect fingernails far more easily than fingertips. – The locker areas can get a little crowded. As you might expect, the lockers and kiosks at the front of the locker areas are always the most crowded. Look for empty kiosks (and, therefore, empty lockers) at the back. 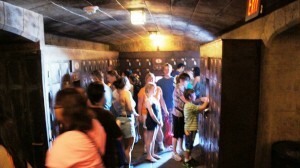 Similarly, tour groups can really bog down the whole ride locker experience. If you have to use the ride lockers and you see a large tour group approaching an attraction, try to get in front of them! Otherwise, depending on the size of the tour group, you might want to circle back to the ride later. – None of the lockers at Universal Orlando are waterproof. If it looks like rain is going to hit as soon as you stow your belongings, take proper measures by either selecting a locker that is in a well-protected area or by keeping your sensitive items wrapped in their own waterproof gear. 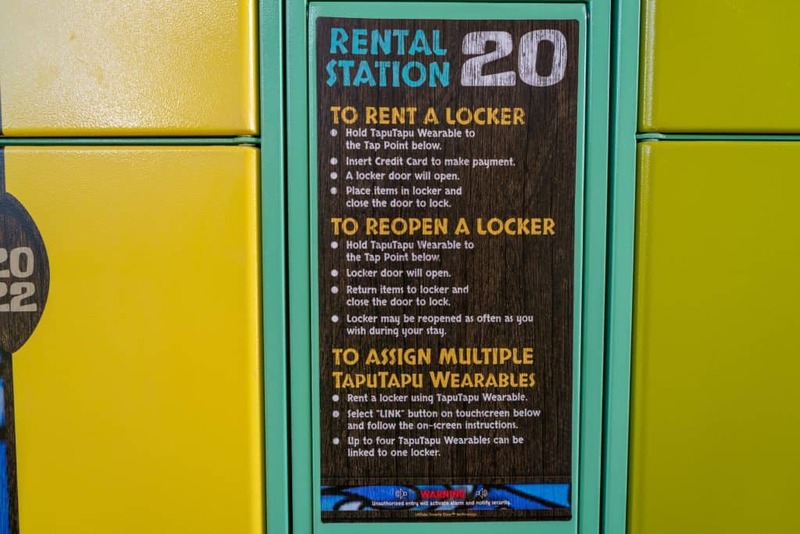 Thanks to the presence of the TapuTapu wearable, which is passed out to each guest as he enters the water theme park, lockers operate a bit differently here than at the two Universal Orlando theme parks. This seems to be a somewhat fluid process for the time being, as Universal continues to work out all the kinks of Volcano Bay. Don’t worry, though – we’ll keep this guide up-to-date for you. 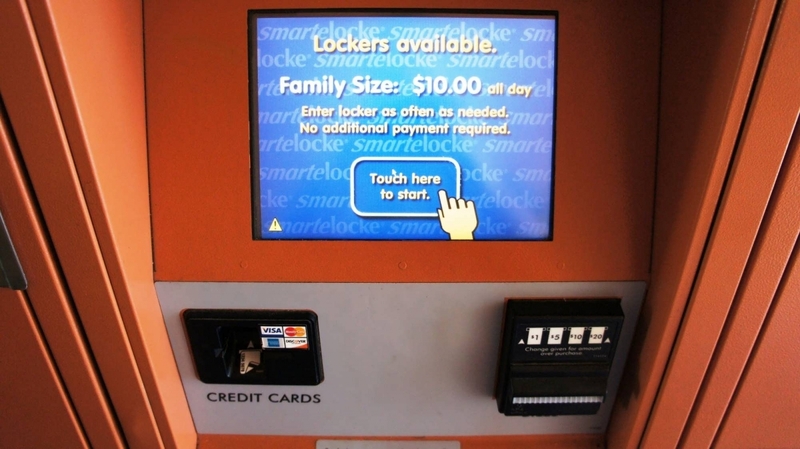 How you plan on paying for your locker determines what exact process you’ll follow. Each set of lockers has a kiosk located at the front of the area, with a locker attendant stationed next to it. 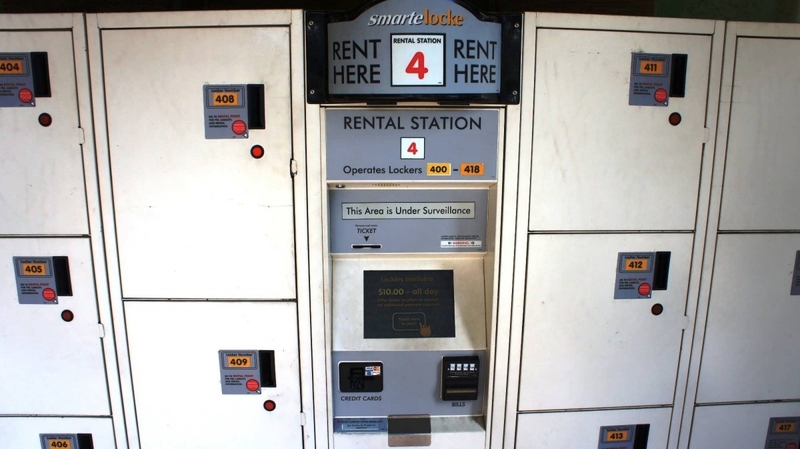 If you wish to use your TapuTapu or hotel-room card to rent your locker, you’ll need to see the team member, who will ring you up with a portable register; the kiosk is for those customers paying with cash. 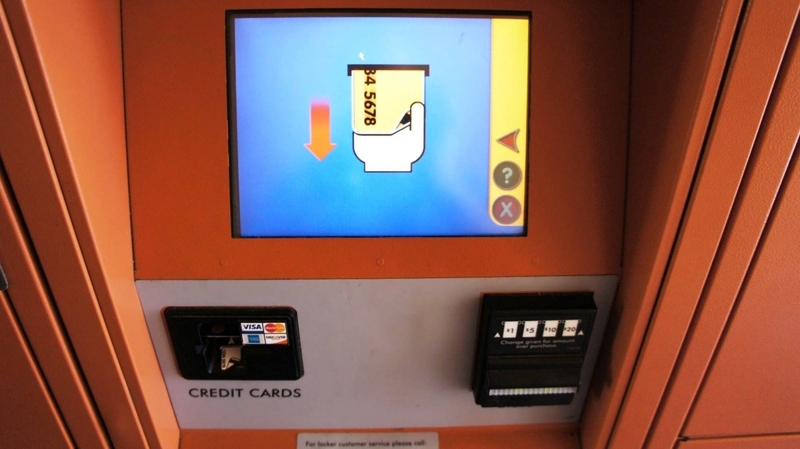 And if you have a credit card, you can bypass this step altogether and just go directly to an individual locker to pay there. Let’s get a little more in-depth with the proceedings, shall we? Credit-card customers go to their locker’s touchscreen, press “rent locker,” swipe their card, and then scan their TapuTapu, which will result in their locker popping open. 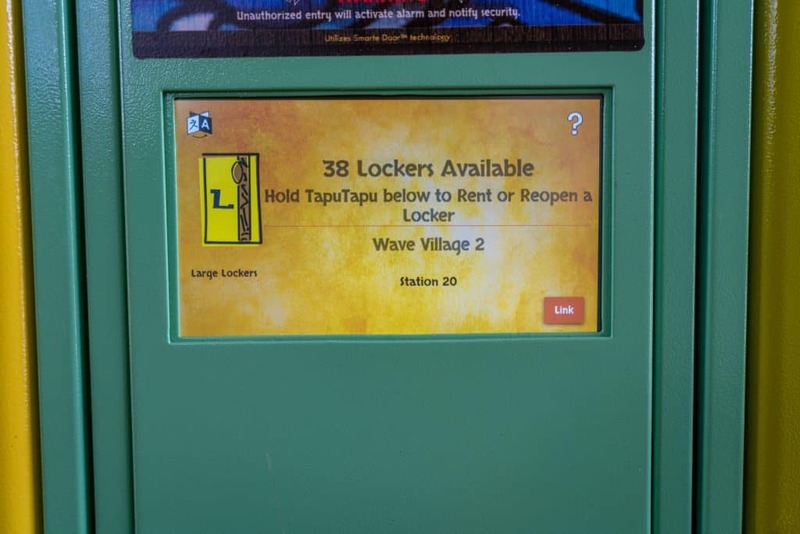 For the other two methods, there’s an extra step involved: first, you get assigned a locker station, and then you find your individual locker and hold your TapuTapu to the Tap Point. Once you’ve put all your belongings into the locker, just close the door to lock it. To reopen it, swipe your device again – no need to memorize a security code. You can use the locker as much as you’d like throughout the entire day. Even better, multiple TapuTapus can be linked to the same locker. Just press the “link” button on the screen and then scan the other person’s wearable. Since water parks typically mean being soaked all day long, one can never have a surplus of lockers, right? 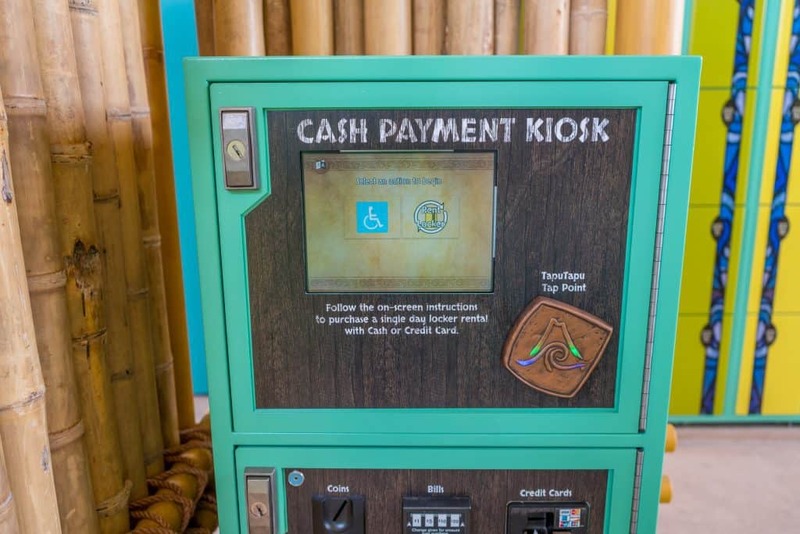 Universal hopes that’s the case – and that providing you extra ones will prove to be a big enough perk to help make you rent one of its premium add-ons that are offered at Volcano Bay. 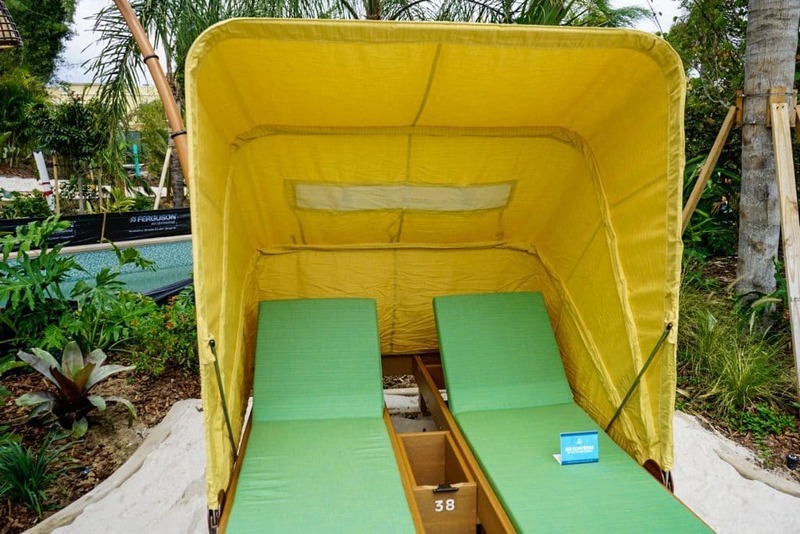 See the locker positioned between the two lounge chairs in Volcano Bay’s Premium Seating? Both the Premium Seating‘s padded lounge chairs and a private cabana come equipped with a locker that only one guest can activate; this is accomplished by pressing her TapuTapu against the locker one time to lock it and a second time to unlock it. Yes, unlike the park’s standard lockers, this means that a party will have to have that one person (or, at least, her TapuTapu) present in order to either stow away or gather their possessions. 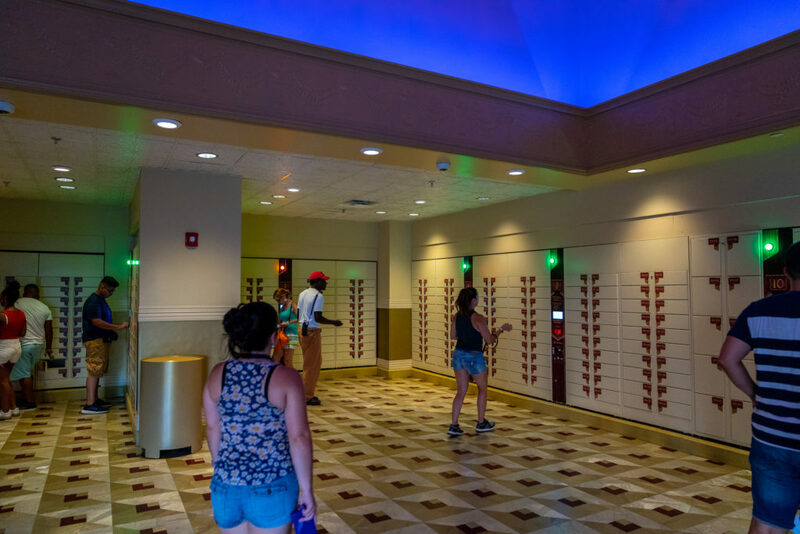 We only have two insider tips or recommendations for how to best use Volcano Bay’s lockers, but we think they’ll have a potentially large effect on your aquatic day. When the water theme park reaches capacity – which has been a lot so far during its first year of operation – lockers can be few and far between. 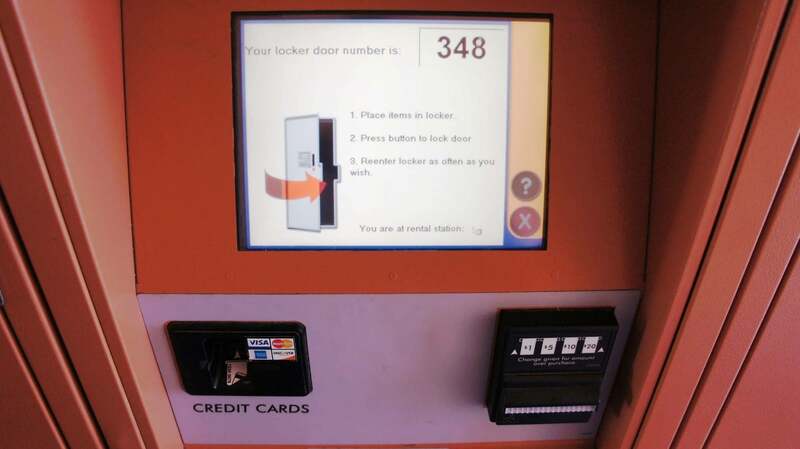 We recommend checking out the locker station in between Bambu and Maku Puihi, as that one is a little more secluded and, thus, more prone to being overlooked by guests. 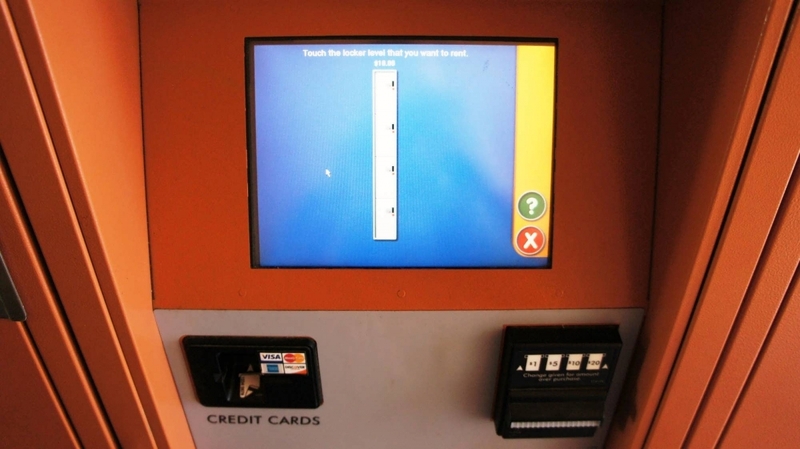 Furthermore, once you’ve managed to land your locker, we suggest paying with good, old-fashioned cash or credit, thereby allowing you to circumvent having to go through a team member, who may or may not be busy when you arrive. 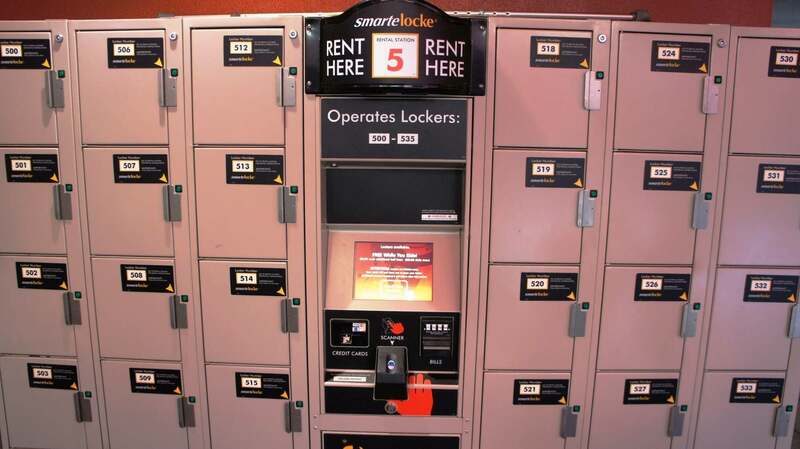 – A locker attendant should always be at the mandatory ride lockers. 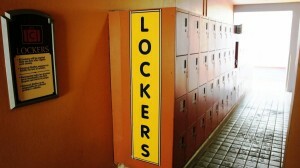 However, for a few different reasons, there is not always a locker attendant at the lockers themselves. If you check the entire locker area and cannot find an attendant, speak with the ride attendant at the front of the queue. There’s a chance the locker attendant may have stepped away to use the restroom, for example, and the at-front ride attendant should be able to radio for help. 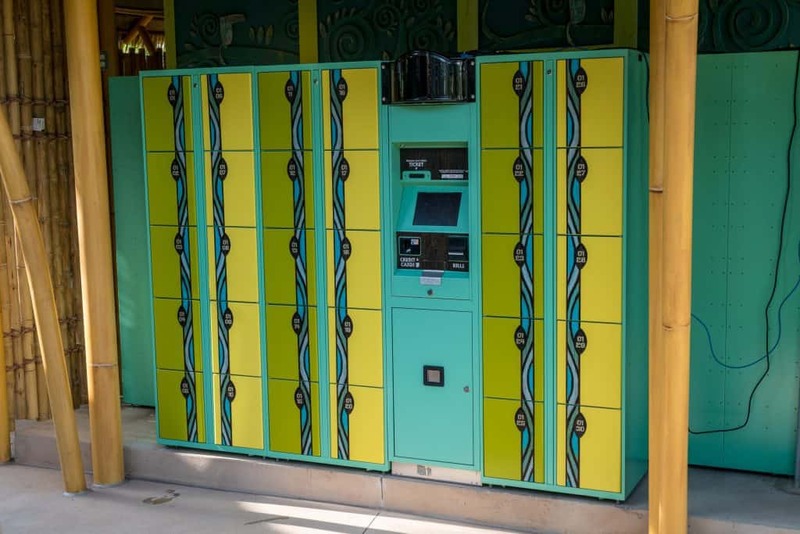 – If you forget to put an item into a mandatory ride locker, it’s not recommended to re-open that locker and stuff the item(s) inside that locker, because opening it means you have finished use of that locker, and it’s very likely another guest will be able to access it. Instead, just get a second locker. – The person in your party operating the locker touchscreen, and submitting a fingerprint, should be between the ages of 13 and 65. Younger children’s fingerprints tend to not re-open the locker properly, due to their being too small to detect, and older guests’ fingers tend not to read due to the inconsistencies and dryness of the guests’ fingers. – A variation of Child Swap is called Bag Swap. It works just the same as Child Swap, but instead of having the non-rider watching a kid, he or she can watch all the bags. (In other words, you don’t need a child to use the Child Swap rooms.) This will be handy if you happen to be carrying something too large for the lockers — like a huge plush toy you won! – Finally, once you have your items inside the locker, close the door, ensure it’s closed, and press the green button next to the door. This is the best way to ensure the locker has securely locked itself. If you do not push this button, the locker will automatically lock after about five seconds. However, in a crowded situation, five seconds could give someone else just enough time to re-open the door as you run off to the queue. 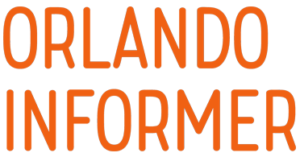 What can I bring into Universal? Please be advised that all bags and personal items are subject to inspection (source). The tip about some screens not being very responsive is so true. I thought my husband was going to put a hole through the screen trying to poke it repeatedly with his fingertip! 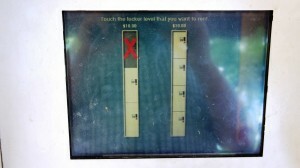 One kind park-goer told him to try his knuckle and “knock” the screen – worked like a charm. We knocked from then on. The first couple times we used the lockers — due to our excitement to get that locker thing out of the way and get on the rides — no one committed the locker number to memory. We got off the ride and stood in front of the lockers looking at each other. One time, we didn’t even know what section of lockers we were in! After that, I put a quick note in my phone with the locker number. Very handy and saved us further embarrassment! 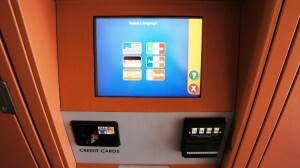 Great tip about searching for a free kiosk towards the back. We found this especially true at Men in Black. There was a huge line winding out towards the main walkway of people waiting in line for a locker, while there were many open screens towards the back and in the other rows. Eventually, we (finally) had it figured out, and even found ourselves helping others that had the same confused look we had!